When you look at a man, what are the things that make him impressive to you? It is obviously how he looks, right? At least, that is the first thing that you check out. Now, what is the best description of ‘looks’ to you? Is it only the physique of the guy or how he carries himself throughout? Obviously, it is the entire personality of the man you are looking at. And to enhance that personality, certain things do matter. Not only dress, but there are essential accessories, like shoes, glasses, shades, and bags that are important to make a man look perfect. And when it comes about bags, genuine leather messenger bags really play essential roles in enhancing a guy’s look. If you think backpacks are not great options to carry a laptop or any other things and you want variation, go for leather sling bag as those are really fashionable. You can go to the office with these bags or they are also suitable for carrying on any other occasions. Now, why should you buy messenger bags? Today, people in white collar jobs often need to carry their laptops. It can be a business meeting, or you may need to give Powerpoint presentation, laptops are really very important. Carrying a backpack is really backdated. Whether it comes in terms of style or functionality, messenger bags are more efficient in both the ways. If you think sling bags are only to look fashionable, that’s not true. They are sturdy if you buy leather. If you are a person who always gets troubled in finding your things, messenger bags are your things. Usually, messenger bags come with two pockets. So, it is quite easy to keep your things organized so that you can find them faster. If you are using one for your college, you will find several inner pockets which can be used for keeping a pen, books, and lots of other stuff. While buying leather bags, you need to make sure that it is made of full grain leather. Such types of leather bags are really of top-quality and they can look gorgeous for several years. Actually, there are two types of leather tanning processes. The first one is chrome tanning and then comes vegetable tanning. Try to avoid the formal one as lots of harsh chemicals, like chromium are used for polishing. Using such bags can be harmful to health. Go for leather bags of vegetable tanning as those are eco-friendly. Such bags are also durable and sturdy than their chrome counterparts. In leather bags, the stitching has to be invisible and straight and there should not be any lost the thread. While buying one, you have to check out the inner side as well as the outer surface well. Before buying a leather bag, check out the little hardware of the bag, that are the buckles, zipper, locks, metallic rings, fitting of the shoulder straps and so on. For a more authentic and traditional look, you can choose genuine leather messenger bags. They are also good for longer use. PU leather and Synthetic leather messenger bag are easily affordable but not longlasting. You can also buy sling bags made of rubber, but those are not suitable for all types of weather. In high temperature, rubber bags become vulnerable. Nylon bags are in demand as they are versatile, colorful and durable. Nylon bags are also fashionable and water resistant. Among the young generation, the canvas is really popular. They are sturdy and thick and also lightweight, durable and water resistant. While buying messenger bags for men, check out the interior. If you want to carry electronic devices, like a laptop, iPad or camera, then you need a padded and thick interior. The best inner lining is of nylon that is durable and keeps your bag out of reach from the materials you carry. Though plastic-made interior looks attractive, they are not durable at all. Do you travel a lot? In that case, you should go for a messenger bag that comes with double closure. Thus, you can store your things in an organized way. Go for a bag where it is secured by a zipper closure and then with the flap closure for double protection. If you ever forget to close the zipper, the flap cover can keep your things protected. Make sure you buy a sling bag with adjustable strap. If you are riding a bike, then go for customized straps that make it easy to carry the bag while riding. Go for padded straps as that won’t create tension on your shoulder while carrying. This is another important thing while buying the best leather sling bag? Know the purpose of carrying it to decide how many compartments you need to carry. Go for a bag that comes with small pockets with double compartments where you can keep the phone, headphones, and other essential things. Hopefully, this entire guideline will help you to find the best genuine leather messenger bags for a man to enhance their look. Now, it’s time to find the best messenger bags for you. While talking about the best sling/messenger bags for men, this will definitely be on the top of the list. This premium leather messenger bag is an epitome of class and sophistication. The pockets are specially made for men who are quite particular with their things. It comes with adjustable shoulder straps that make it easy to carry. If you are a man of style and want to make a strong impression with your appearance, this is the accessories that you can buy for yourself. This bag is really lightweight and it won’t create any pressure on your shoulder. Comes with non-detachable sling strap, this messenger bag can really enhance your style quotient. This is another premium leather messenger bag that is really in fashion and also quite effective to use. If black leather bag defines the elegance and sophistication of a gentleman, this is the one to buy now. You can be absolutely sure of the quality of this bag as it is made of full grain leather and comes with a shiny effect. The adjustable straps make it easier to carry, even while riding bikes. Fossil Mayfair leather sling bag is one of the best genuine leather sling bag. If you want a branded bag that defines your personality the most, you should go for this Calvin Klein product. Sophistication and sleek design is the definition of this bag. The textured, matte-finish look is perfect to enhance your professional look at the office. It comes with enough space to carry your essentials well. Calvin Klein Solid Messanger bag is one of the best men’s leather messenger bags for office and meetings. Do you want a bag that becomes your style statement at your office? This black sling bag is the one you are looking for. With enough space and pockets, this bag can make you organized and also add an oomph factor to your appearance. The adjustable buckles and the flap cover are there to keep your things protected. This black messenger bag is really efficient in keeping your entire essential perfectly and it is an awesome accessory to carry. When you are concerned about durability, you should go for this product as it is hardy and comes with a neat finish. The bag is spacious enough to carry many things together. If you are looking for an affordable leather messenger bag that is stylish also, this Phive Rivers product is the thing that you are looking for. To eliminate your Monday Blues and start your day with full of energy, you need to focus on your look. This is the bag that can make you prepare for a busy day. You can use this bag for traveling purpose or carry a laptop on office days. To create a perfect office look, bags and shoes always play an essential role. Why don’t you go for this black leather messenger bag that is only made for that? Though it is not for carrying a laptop, there are lots of other essentials that you need to carry while going to the office. Go for it and establish your own statement. If you want a leather messenger bag and that is also in a budget-friendly way, then this is the bag you can buy now. Made of full grain genuine leather, this high-quality messenger bag comes with excellent design, hand-stitched and lightweight. The buckles and zippers are made of high-quality product and the adjustable shoulder strap makes the bag easy to carry. Whether you are going to school, college or office, this bag is suitable for everywhere. While you are looking for a budget-friendly leather messenger bag, this is the one that can meet your search. This elegant bag comes with four pockets that make it easy to carry several objects together. With magnetic type closure, this bag is worth to buy. If you find leather bags are too pricy, and still you want that look in a much affordable messenger bag, this bag can meet your need. It is within your budget and perfect for carrying a laptop at your workspace. The sleek and sophisticated design of such a bag is perfect for office use. There are three pockets in this bag that are useful for keeping all your essentials in an organized way. This bag is unisex, so ladies can also use it at the office. If you are willing to buy a brown leather messenger bag of premium quality, this is the product that will woo you definitely. It is particularly made for carrying laptops. There is one compartment that is laptop compatible. The adjustable straps will help you to carry the bag with ease and it comes with a look of sophistication that will add to your strong appearance. Buying a leather bag means something that can be with you years after years. This is the bag that has enough longevity and durability along with maintaining your perfect office look. Made of top quality leather, this bag comes with detachable and adjustable straps. If you want to carry it in your hand, you can do that with the twin grab handles. As this bag is for both men and women, all of you can use it for daily purpose. If you think leather bags are out of your reach as they are too much expensive, you are going all wrong. Here, this is the product that comes on the top of the list of the affordable leather messenger bag. The matte finish of the bag gives a tanned look that looks quite sophisticated. Made of buffalo hide leather, this bag is popular because of its durability and longevity. 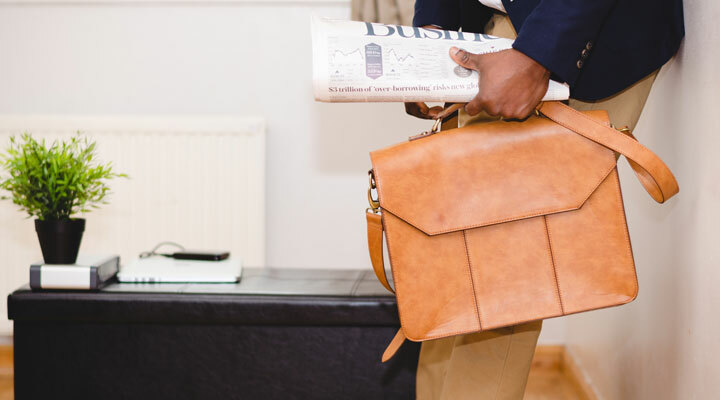 This is another example of a budget-friendly leather messenger bag that you can carry while going to business meetings, office, and college, everywhere. This product is available in two colors- black and brown. Pick the one that suits you the most. If you are looking for a bag to carry your laptop other than a backpack, this messenger bag is really a great option for you. To create that professional look while going to the office, this bag is perfect. Even you can carry it with your casuals while going for an outing or to college. Try not to carry it in the rain as the bag is not waterproof. To sum up the list of the best genuine leather messenger bags, there is no better option than this bag. Black in color, this bag is perfect for office goers or the college students. Sleek and sophisticated, it goes with formals as well as with casuals. Pick the One of Your Favorite! So, here you get enough option of your choice! Backpacks are really the story of previous years. In 2019, if you want to set your exclusive style statement at your college or at the workplace, messenger bags are the one to do that for you. They are spacious enough and yet look stylish. Go ahead and pick the one that suits you the most.